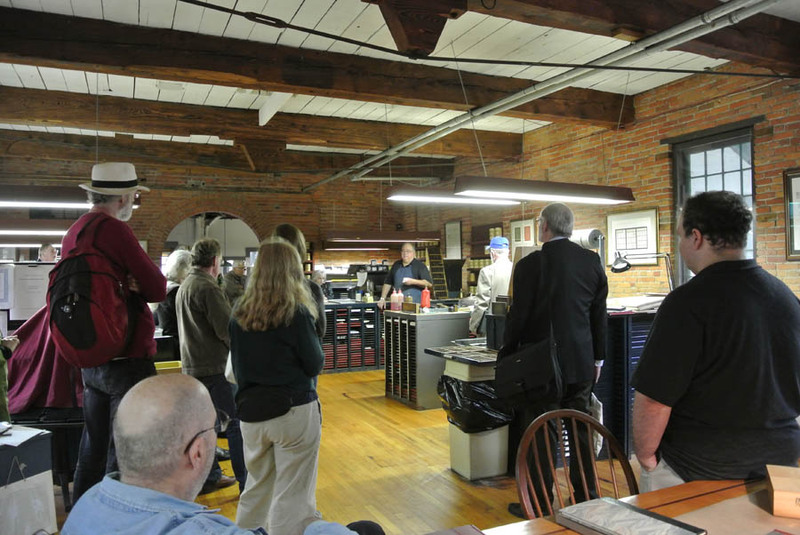 On Thursday, October 22, 2015, twenty participants from the American Printing History Association’s annual conference took a bus to Skaneateles, New York, to tour the Bixler Press & Letterfoundry. Some people decided to attend this year’s APHA conference because it would give them this opportunity. 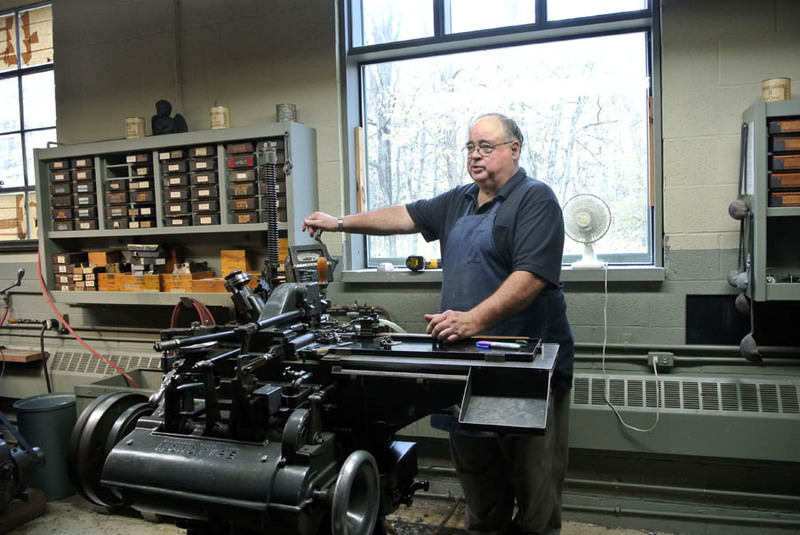 The Bixlers have the most extensive collection of classic English Monotype book faces in the United States, including over 7,000 accented matrices. Michael Bixler casts fonts of type on commission. 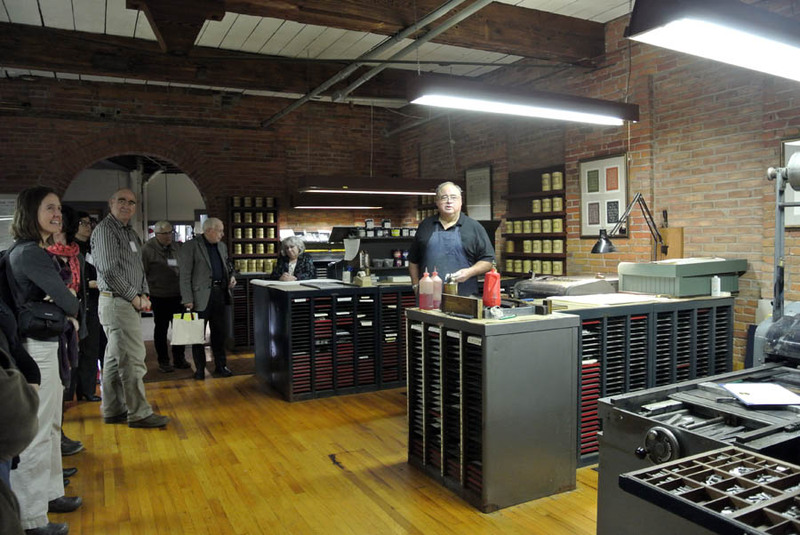 He and his wife Winifred design, set, and print books and ephemera directly from their cast metal type on a variety of Vandercook and Heidelberg cylinder presses. 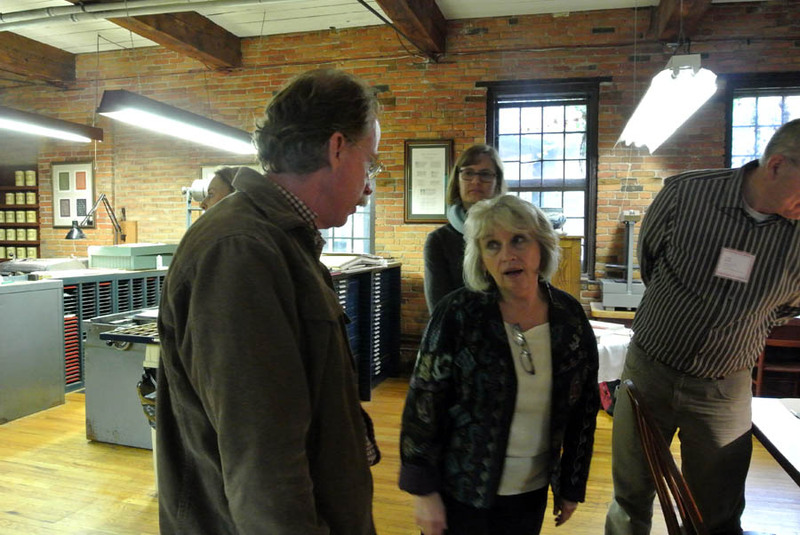 Michael and Winifred gave us an overview of their work and answered our questions before welcoming us to walk through the shop. Examples of printed books and broadsides were available for us to see, and we marveled at how clean and orderly everything was. Winifred gave us some tips in her immaculate composing area. Michael showed us how the type casting machines worked and set some ornaments for us to take home. Thank you, Michael and Winnie, for a fantastic tour! This short clip of Morris Benton walking through the woods and sitting, looking at the camera, was probably filmed by his wife Katrina in the late 1930s in Beaver Lake, New Jersey, where they had a summer cottage. It testifies to Morris Benton’s whimsical side. Benton made home movies on 16 mm film in the 1930s and ’40s. His grandson, Larry Gregg, filmed all of Morris Benton’s old movies on a screen, digitally edited them, and made several DVDs to share with his family. In addition to documenting family gatherings, especially his granddaughters’ diving and rowing accomplishments at very young ages, Benton also recorded his travels, showing an affinity for the extended, slow pan, both horizontally for landscapes and vertically for very tall buildings. How did Morris Benton’s reticent temperament and seemingly mundane personality affect his working life? I would venture to say that they were assets. On March 12, 2015, the RIT Cary Collection in Rochester, NY, will open a new exhibition on the gregarious and prolific type designer to whom Benton is often compared, entitled “Frederic W. Goudy: 150 Years of Typographic Influence.” Steve Matteson, Creative Type Director at Monotype, will speak at 5 p.m. on Discovering the Goudy Legacy. The Cary Collection is home to many Goudy artifacts, including some type original drawings and The Paw, the plaster cast of FWG’s hand, said to bestow bad luck upon touch. I once was talking to a man who designed a very pleasing advertising type which undoubtedly all of you have used. I said something about what artists think about a certain problem, and he replied with a beautiful gesture: ‘Ah, madam, we artists do not think – we feel!’ That same day I quoted that remark to another designer of my acquaintance, and he, being less poetically inclined, murmured: ‘I’m not feeling very well today, I think!’ He was right, he did think; he was the thinking sort; and that is why he is not so good a painter, and to my mind ten times better as a typographer and type designer than the man who instinctively avoided anything as coherent as a reason. 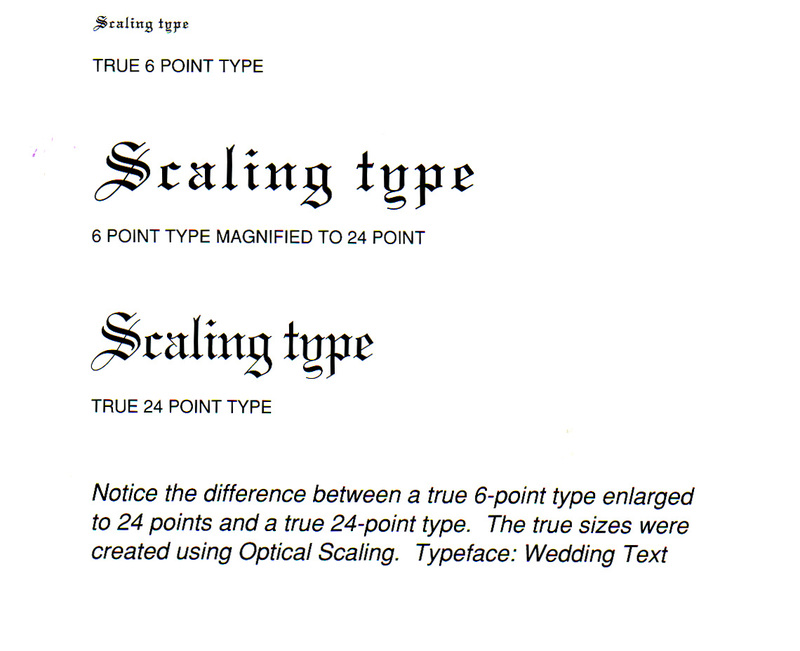 The two type designers to whom Warde was referring were most likely type designer Frederic Goudy, and Morris Benton, ATF’s chief type designer, who had a mechanical engineering degree from Cornell University. Goudy and Beatrice Warde must have met at ATF because Goudy made frequent visits to the company when it was located in Jersey City. 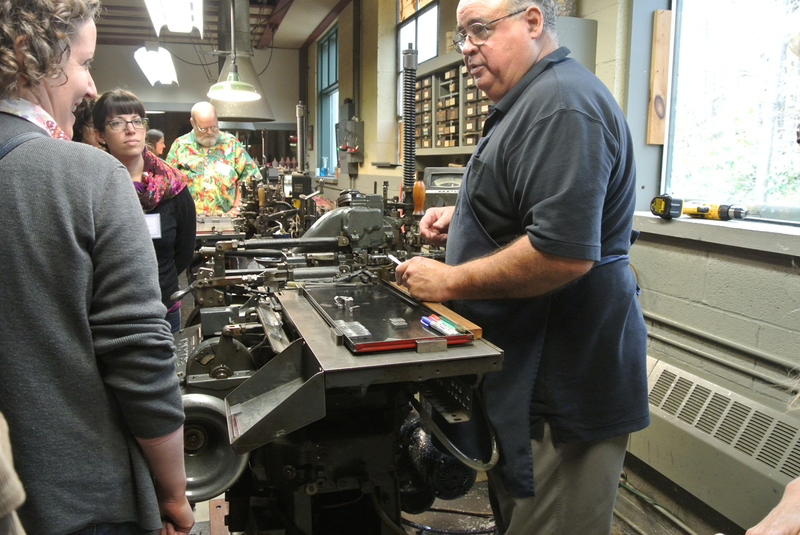 Goudy was famous at ATF for his artistic temperament, and Benton for his reticence. 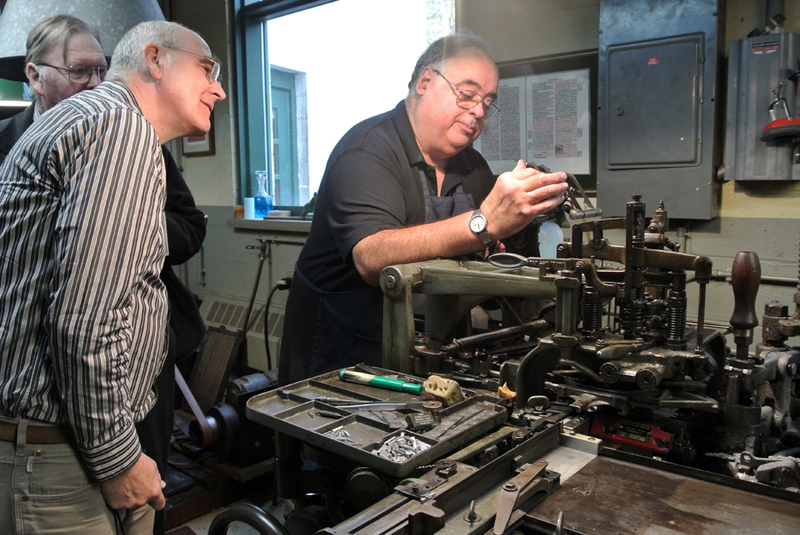 That Warde was speaking of Goudy and Benton was also the opinion of Richard C. Marder, whose grandfather John Marder of Chicago’s Marder, Luse & Co. was one of the original founders of ATF. 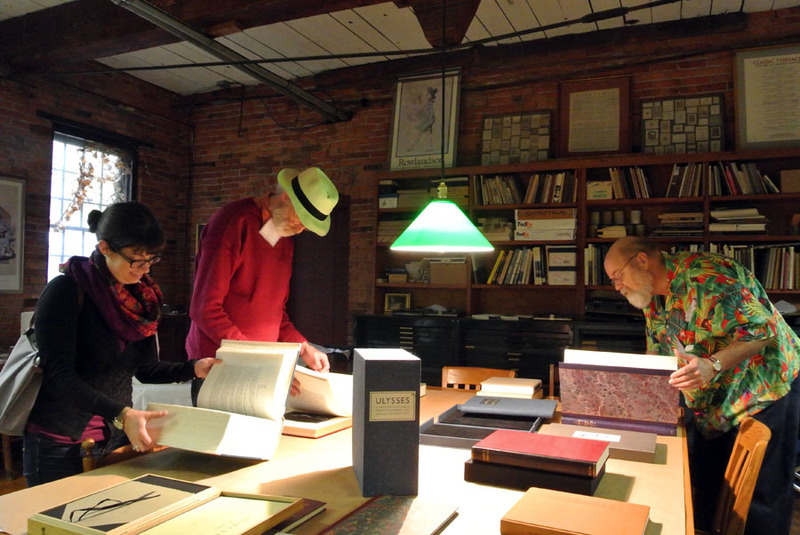 Richard Marder spent a lot of time on Saturdays in ATF’s typographic library, often seeing Morris Benton there because Saturdays were half-workdays. He may not have been as lively or extroverted as Goudy, but Benton’s attention to detail and his engineering bent no doubt helped him in the business of type designing. 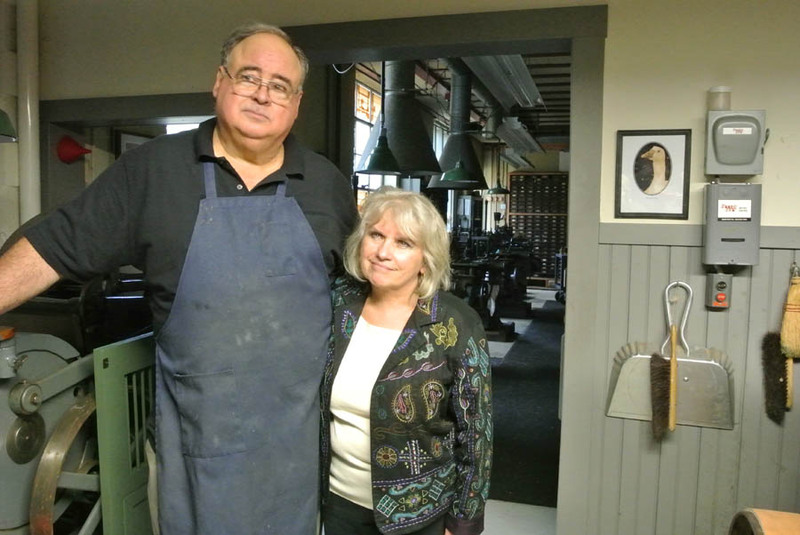 He didn’t consider himself an “artist,” and that’s not a bad thing. Beatrice Warde, The Crystal Goblet: Sixteen Essays on Typography (Cleveland and New York: World Publishing Co., 1956), 14–15. Frederic Goudy, A Half-Century of Type Design & Typography, 1895–1945 (New York: The Typophiles, 1946), 1:92. Richard C. Marder, handwritten note on my original Benton master’s thesis, 1986. On February 10th, Matthew Carter is going to speak at RIT on “Genuine Imitations: A Type Designer’s View of Revivals.” It will be thrilling for me, and I’m sure for many RIT students. The event is meant to celebrate the publication of my new book, The Bentons: How an American Father and Son Changed the Printing Industry. (Carter graciously wrote the Foreword back in 2007.) I’ll start out talking about Morris Benton’s Type Revivals, which were groundbreaking in their own day, and Matthew Carter will bring the discussion into the 21st century. I asked David whether he got the original Benton drawings for Bodoni at the ATF auction in 1993, and he said no, that he didn’t actually know where they came from, since they were already part of the collection when he arrived at RIT in 1979. Some of the drawings are hard to see on the yellowed paper, but after a little bit of magic on the computer (thanks, Frank Cost! ), they are pretty amazing. 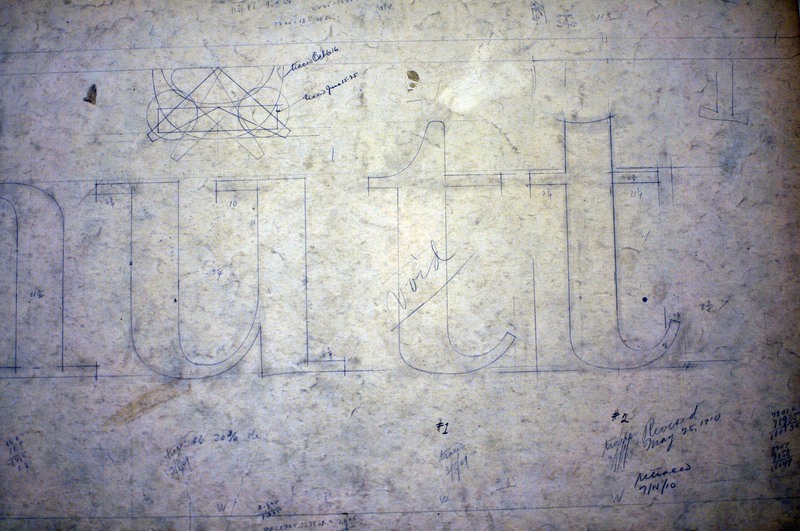 In the image below, you can see how the lower case t was revised more than a year after the original drawing. The letters (from baseline to the top of the ascender line) are about nine inches high. 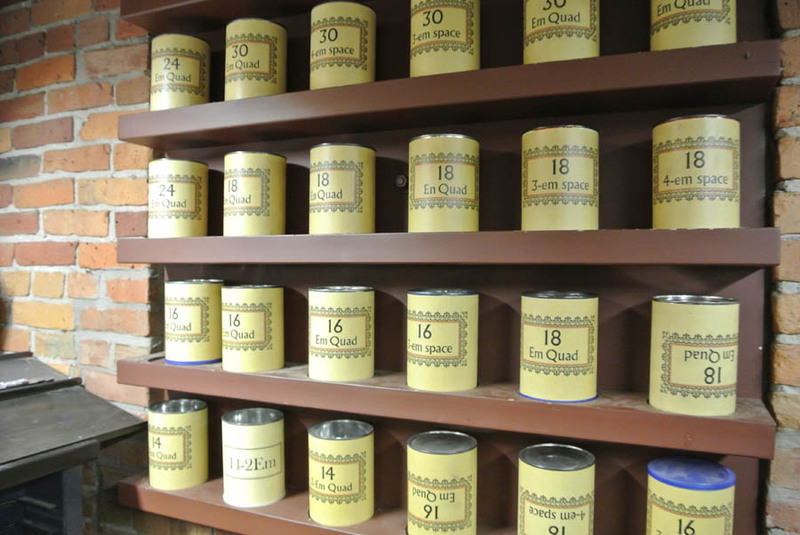 There are many markings on each sheet, some with equations or other numbers. 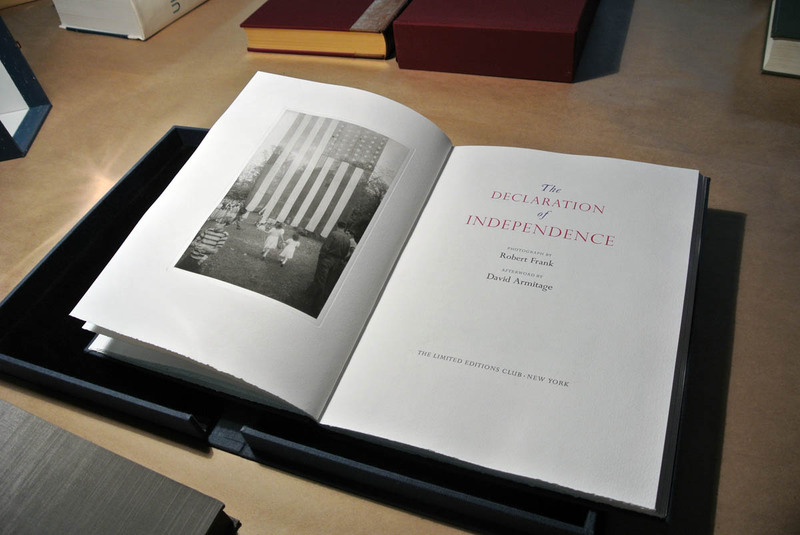 Why Morris Benton revived types is easier to discuss than how, since he didn’t leave notes or diaries about his work. Of course, we do know how types were made at ATF, but did Morris Benton start with a small, inked-in drawing, or a larger outline drawing, or did he perhaps enlarge and then trace over the original examples that were in ATF’s Typographic Library and Museum? We don’t know. Unlike his father, who wrote several essays about type and about his work, and also a manual for the matrix engravers that ATF sold to Japanese companies, Morris Benton didn’t leave a written record, except, it appears, for the several boxes of letters that he wrote to his fiancée Mary Ethel Bottum during their four-year engagement!! The books are due back from the printer any day now. Hope to see you on February 10th!